Q. Do you consider Martin Luther a Calvinist, since he believed in loss of salvation? A. Strictly speaking, Martin Luther (1483–1546) could not be called a Calvinist since he did not follow Calvin. 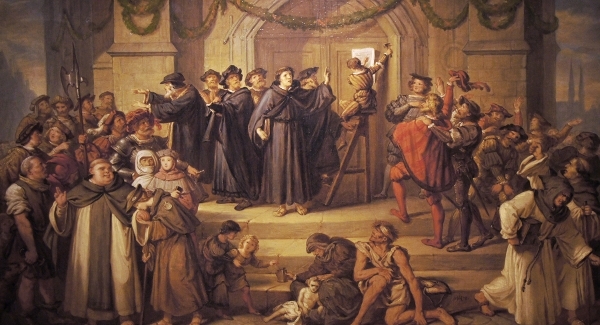 Luther started the Reformation in 1517, while John Calvin (1509–1564) did not write the first edition of his Institutes of the Christian Religion until 1536. On October 31, 1517, something happened that changed the world. Do you know what it was? Even the man who did it didn’t know the effect it would have. On October 31, 1517, a Roman Catholic Augustinian monk and priest by the name of Martin Luther (1483–1546) nailed a notice on the door at Wittenberg Castle church in Germany. To Luther, it was a relatively small act. This was the common way of scheduling a debate in those days. But the world has not been the same since.